Cellaria Estate is located in Vlychada and offers a seasonal outdoor swimming pool, a tennis court and a garden. Free WiFi is featured. 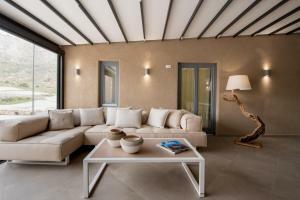 The air-conditioned villa consists of 5 bedrooms, a kitchen and a bathroom. A flat-screen TV is offered. The villa has a sun terrace. A car rental service is available at Cellaria Estate. Oia is 13 miles from the accommodation. The nearest airport is Santorini International Airport, 7 miles from the property. When would you like to stay at Cellaria Estate? Cellaria Estate is a - newly built - luxurious accommodation, strategically located in the most unique spot of Santorini Island, Vlychada, famous for its lunar landscape and savage beauty of the sculptured rocks. 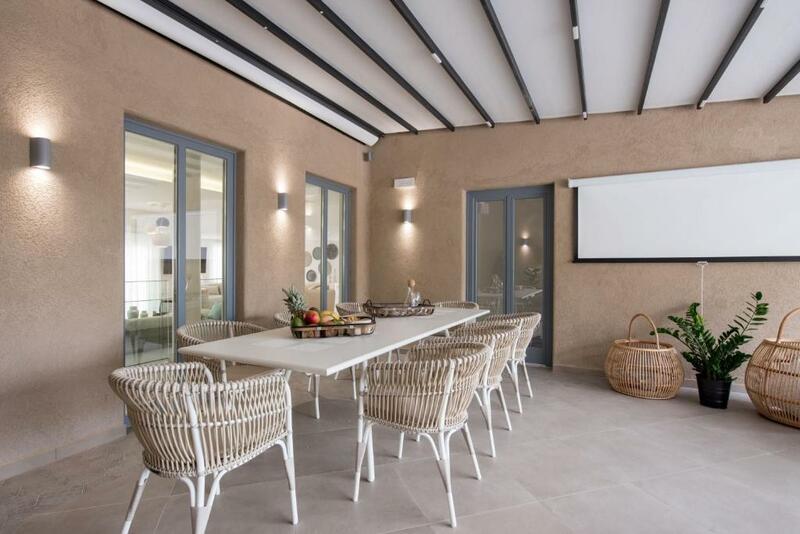 Cellaria Estate has been manufactured with high quality materials, advanced technology, elegant minimalistic decoration and VIP facilities, able to accommodate up to 12 guests and satisfy even the most demanding preferences. Surrounded by 32 acres of vineyard, Cellaria Estate offers panoramic sea view to the South Coast of Santorini. Among its luxurious facilities is provided Heliport, Tennis Court and a stone – built underground Cellar with sitting and dining area, where our valued guests may taste some of the rarest and awarded wine and champagne labels. Cellaria Estate is an ideal choice for accommodation, since it offers absolute privacy and tranquility, details that guarantee an exceptional accommodating experience and an event you will never forget and regret. House Rules Cellaria Estate takes special requests – add in the next step! Please inform Cellaria Estate of your expected arrival time in advance. You can use the Special Requests box when booking, or contact the property directly using the contact details in your confirmation. We need at least 5 reviews before we can calculate a review score. If you book and review your stay, you can help Cellaria Estate meet this goal.